We created this website as a resource for educators, students, reading groups, community groups, and public policy makers interested in learning more about the themes of immigration, day-labor, and community. We have designed the website as a reading guide for the book to elicit reflection and discussion with links to research reports and other useful information and resources that explore issues raised in the book in greater depth. We have created a tab for each chapter of the book with questions, exercises, and resource links to guide discussion and serve as starting points for further research. You can find them by clicking on the "Chapter Guides & Educational Resources" tab. Over the past two decades communities across the United States have experienced a rapid influx of primarily Latin American migrants. These New Destinations for Latino migration have responded to the changes in different ways. Some communities have passed restrictive ordinances devised to deflect unauthorized immigration. The logic behind such an approach is that if life for unauthorized immigrants becomes particularly difficult in a given locality they will leave. However, such logic inevitably leads to mistrust, fear, and a distinct sense of rejection that permeates the entire community. In other communities, local responses have been more productive and positive. 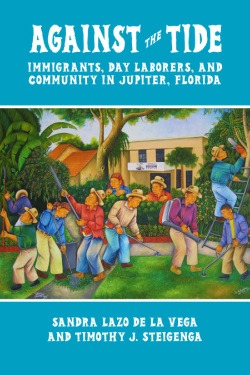 Against the Tide: Immigrants, Day Laborers and Community tells the story of Jupiter Florida, one community in South Florida that has engaged the immigrant community in a manner that is both innovative and integrative, creating the opportunity for the two-way process of immigrant integration to take place. We wrote this book with the hope that it will reach people in communities addressing similar issues to illustrate the value of local and practical approaches to dealing with otherwise intractable issues.